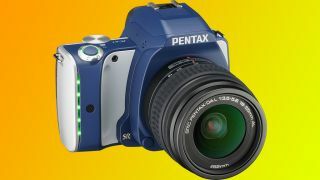 After releasing a long line of reserved DSLR camera bodies like the Pentax K-3, Ricoh has flipped its script and outed the self-illuminated Pentax K-S1. While most street photographers would cover up lights on their camera, the Pentax K-S1 features a string of green LEDs along its boxy grip as well as an illuminated ring around the shutter button. Supposedly these lights will change color depending on what the camera is doing any any give point. When taking photos the camera's lights will turn green, and shooting video will cause the camera to glow red. Looks aside, the new Pentax K-S1 features a newly developed 20.12Mp CMOS sensor with a maximum sensitivity of ISO 102,800. The K-S1 is also capable of a maximum shutter speed of 1/6000-second, plus 5.4fps in continuous shooting mode. On the back users will find a 3-inch, 920k dot LCD screen as well as an optical viewfinder featuring a 100% field of view at 0.95x magnification. As with all of Ricoh's multicolored DLSRs, the Pentax K-S1 will come in 12 different hues. The rainbow-colored variants range from black and white to more artistic combinations such as Dawn Purple and Denim Blue. No matter what color users pick the Pentax K-S1 will be available by mid-September for £549.99 (about $911, AU$976) body-only. Alternatively users could pick up the camera kitted with the SMC DA L 18-55mm f3.5-5.6 lens for £599.99 (about $994, AU$1,065). For £679.99 (about $1,127, AU$1,207) shooters could also purchase the camera with the 18-55mm f3.5-5.6 lens as well as the SMC DA L 50-200mm f4-5.6 AL lens. Which is the best DSLR on the market?